A blood transfusion is when you're given blood or blood components from blood donors. In New Zealand, all blood comes from unpaid voluntary donors. Processing and storing blood, and selecting donors is very safe and exceeds international standards. From July 2018, specially trained nurses will be giving many blood transfusions in community infusion clinics. These are in medical centres that have doctors available for support in rare cases of complications. Previously, everyone had to go to hospital for blood transfusions. Most blood transfusions are needed to treat people with moderate to severe anaemia. In these people, their anaemia is likely to be causing symptoms such as shortness of breath, deep fatigue or chest pain. 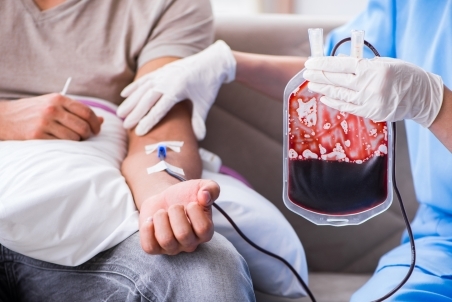 Blood transfusions are also used to treat blood loss caused by injuries or surgery. There are also several less common uses for blood components. Most blood transfusions given in the community are to treat anaemia. How do I get a blood transfusion? From July 2018, you should be able to have your transfusion in the community. This may mean you won't need to wait as long for your transfusion. Your doctor will first check that you're able to have your transfusion in the community. Then they'll refer you to the community infusion service. The community infusion service will contact you with an appointment time. Your doctor will also discuss the treatment with you. They'll ask you to sign a consent form to show that you understand the risks and benefits of the treatment. Some people will still need to go to Christchurch Hospital for blood transfusions. These people will have their blood transfusions at the Medical Day Unit. Before you have the transfusion, you'll need to have a blood test. This tests your blood and makes sure you're given blood that matches your blood type. If you're having your transfusion in the community or at the Medical Day Unit, you'll need to have this blood test within 48 hours of your transfusion. Your doctor will give you a form to get your blood test done at a testing laboratory. You're given the blood through a tube that's inserted into your vein using a needle. It takes two to three hours for each unit of blood to go into your body. The doctor will tell you how many units you need. It's a good idea to have a whānau/family member come with you to your appointment, especially if you need help. You should take your usual prescribed medications unless your doctor advises otherwise. There's a 1 to 2% chance of a minor allergic reaction. This can include a mild fever or skin rash. A major allergic reaction is rare and happens in around one in 100,000 transfusions. If this happens, it's serious and needs treating in hospital as it can cause kidney damage and breathing difficulties. There's a risk that the treatment may not relieve the symptoms. The risk of getting an infection from donated blood is low in New Zealand. The NZ blood service guide to blood transfusion gives more information about this. Blood transfusions are very safe. If your doctor is recommending that you have one, it's most likely that the benefits outweigh any risks. Not having a transfusion could lead to serious health complications and in some cases death. Often you won't need any follow up. Your doctor may want to see you to check your symptoms. They may also want to repeat a blood test to see if your anaemia has improved. If you start to feel unwell after your transfusion, seek medical attention immediately. Especially if you have symptoms such as shortness or breath, high fever or chest pain. One alternative is not to have a transfusion. But the risks of not having a transfusion when you need one far outweigh any risks of having one. There are no alternatives to blood or blood components for routine use. It's possible to have your own blood collected so you can use it for non-urgent operations. But there's a charge for this and it has limited benefits. It's only suitable for people who are healthy, so people with anaemia can't do this. Blood donations from family members aren't any safer than blood from ordinary donors. The NZ blood service discourages this option. This guide to blood transfusion from the NZ blood service has more information. If you have any questions, talk to your doctor or contact the NZ blood service. Canterbury Community HealthPathways – Blood Transfusion Requests, retrieved June 2018. New Zealand Blood Service – Fresh blood components, your guide to blood transfusion, retrieved June 2018.